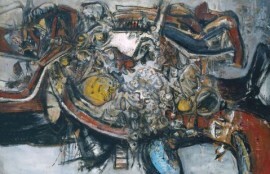 The exhibition traces the development of Davie’s practice over sixty years. A selection of his larger canvases and drawings/prints are on display as part of the series BP Spotlights. 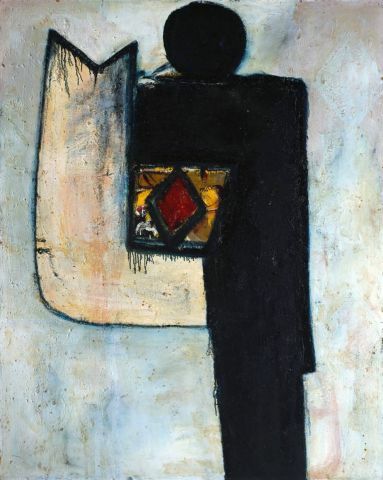 The symbols in his work suggest uprooted mythologies making me think of an artist who is searching within for some kind of connection to a shamanistic self that he feels necessary to explore. 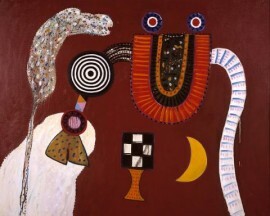 This spiritual element continues to run throughout his work as though he hunted relentlessly for religious meaning and found this through his own experience of working as an artist and through his connection to land and mythology. The scratchiness of some of his drawings reminded me of cave paintings or primitive drawings because of their naivete and animal impulsiveness. He succeeds in what seems like an effortless ability to create paintings that satisfy on a variety of levels as they bemuse with their childlike wit and bewilder with their symbolic importance. In his work I am reminded of decay, birth and formations of the natural world. His mark making has a raw earth-like quality particularly in some of his older works such as “Birth of Venus”. 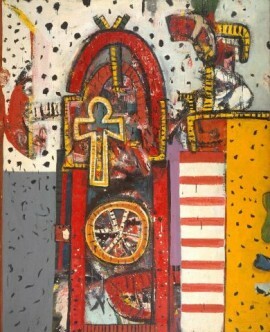 In his newer work however during the 70’s, 80’s he focuses more on areas of flat paint and symbolism such as in “Fairy Tree No. 5”. The most memorable and striking painting in the show is “Image of the Fish God” which combines a loosely figurative image within drippy abstraction. 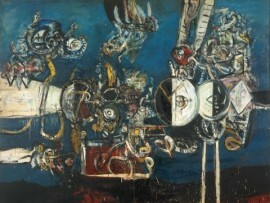 When watching the video of Davie at work on his painting he seems to respond to a visceral impulse within himself. He over-paints quickly over large areas of the canvas bringing in symbols and taking them out in a process of drips, marks, figuration and happy mistakes. The video shows him working on canvases laid out flat while he walks freely over them at times using his soles as a way to contribute to some of the mark making. I think one of the driving forces behind Davie’s work is the feeling that he could never fully understand his own work and was perplexed and fascinated by what arose out of the canvas. I found it instrumental in understanding his work to appreciate that he himself did not always know where a painting was going. What I find interesting is the point at which he decided to finish a painting where he feels it has gone as far as it will go. When reading his own description of his work: “My work is something very strange” it suggests that he is mystified by this strangeness. It is the aspect of not being able to fully grasp a meaning which makes him sit well with other surrealist painters who bewilder the viewer in such ways. I am aware when viewing his work that he fits in with a few art movements such as the surrealists or action painters such as Jackson Pollock or Willem De Kooning and yet he seems to fit in nowhere at all. It is perhaps this quality of not quite being able to pin him down which makes him interesting along with his seemingly obsessive drive to discover something religious and ritualistic within the process of painting.